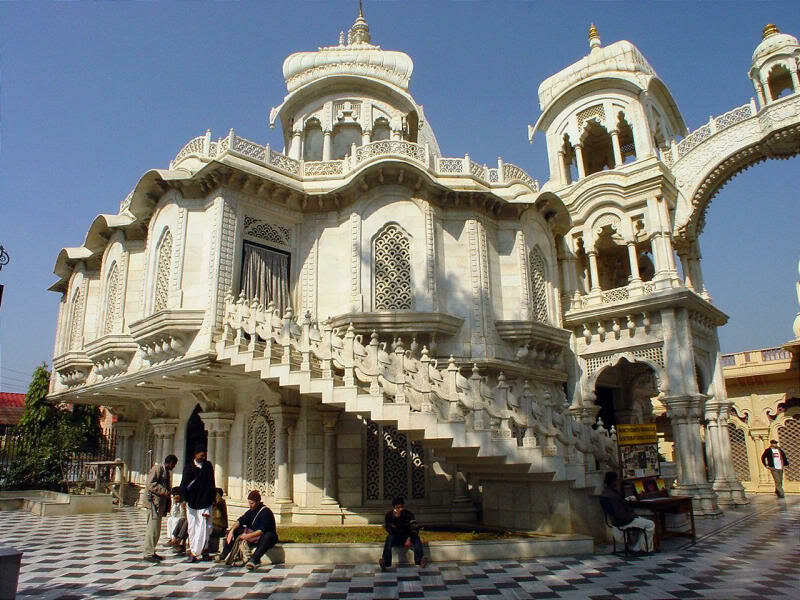 Around 60 kms from Agra on the road to Delhi are the holy twin cities of Mathura and Vrindavan. Associated with the birthplace of Lord Krishna, an incarnation of Lord Vishnu, these twin cities are special pilgrimage centers and are thronged by devotees round the year. Situated on the bank of River Yamuna, Mathura is an ancient city known since ages. Although it is said to be the birthplace of the eighth incarnation of Lord Vishnu, Lord Krishna, the history of this place can be traced back to the period of Ashok and even before that. Mathura has a strategic location, which ensured it to be the important place for trade and commerce. The archaeological findings from this place take us back to 5th century B.C. when it became the eastern capital of the King Kanishka of the Kushan dynasty. During the Gupta and the Maurya dynasties, the art and culture of this place flourished and grew into an industry. It became a major place for trading and learning. Today all that remains of that history has been preserved in the museum and the town of Mathura has become famous for its temples. The whole area is known as the Braj Bhoomi, which includes the place where Lord Krishna was born, and also the places like Nandgaon, his foster father's village and Gokul where he stayed and played with his friends. Vrindavan is around 15 kms from Mathura is also associated with the life of Lord Krishna, and hence is important pilgrimage place. The ancient temples, the picturesque Ghats on the bank of River Yamuna, the invocating prayers and songs for the God and the Pedhas, sweets prepared of milk is what Mathura is famous for today. Location: The city of Mathura in Uttar Pradesh, is located at a distance of 145 km south-east of Delhi and 58 km north-west of Agra. Covering an area of about 3,800 sq. km., today, Brajbhoomi can be divided into two distinct units - the eastern part in the trans-Yamuna tract with places like Gokul, Mahavan, Baldeo, Mat and Bajna and the western side of the Yamuna covering the Mathura region that encompasses Vrindavan, Govardhan, Kusum Sarovar, Barsana and Nandgaon. In a nutshell, the land of Braj starts from Kotban near Hodel about 95 km from Delhi and ends at Runakuta which is known specially for its association with the poet Surdas, an ardent Krishna devotee. Best Time To Visit : October To March & During the month of July-August to witness the Janmashtami celebrations. According to mythology, Lord Krishna killed his maternal uncle Kansa in Mathura when he was still a young boy. Kansa was an evil man who has imprisoned Krishna''s parents and grandfather and would torture his subjects. After killing the evil man Krishna came and rested at this place on the bank of River Yamuna. So this place is called as the Vishram Ghat or the place to rest.